I would like to know if I can get a report from google analytics that can show me how Internet Explorer 8.0 (for example) usage as a percentage of total visits is trending over time. Even just the two columns of data would be fine. You can get a breakdown of which browser is used on your site by clicking on the left hand menu audience >> technology >> browser & OS you then need to select the pie chart that you can see on the right hand side of analytics. You can then select the compare option in the date select area at the top of the page. this will allow you to compare the usage between 2 dates. Please See Below...I have highlighted in green the important areas. Not exactly what you wanted, but on the same report as mentioned, audience >> technology >> browser & OS, choose a "secondary dimension" of "browser version". This will then show IE8, IE9 etc separately over the time period you chose. If you then select the time period you want, 6 months for example and above the graph choose the "month" view. Finally, if you then tick the box to the left of each version you want to view (max 5 at a time) and click on "plot rows" above the table view - the graph will now reflect the changes. You can now hover over each month and see the visits for that month for each browser version and the total number of visits which you can then put in a spreadsheet for graphing etc. Not perfect but hopefully helpful! Google Analytics reporting 5% of users using IE on one site. Most other sites I track are still around 40%. What gives? 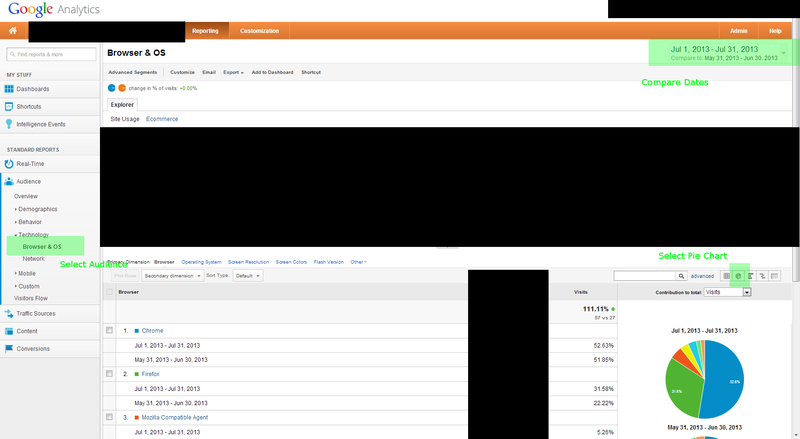 Google Analytics API data for goals (funnels) doesn't match - how do they reconcile? How does Google Analytics aggregate the Count of Visits (Frequency & Recency Report)?